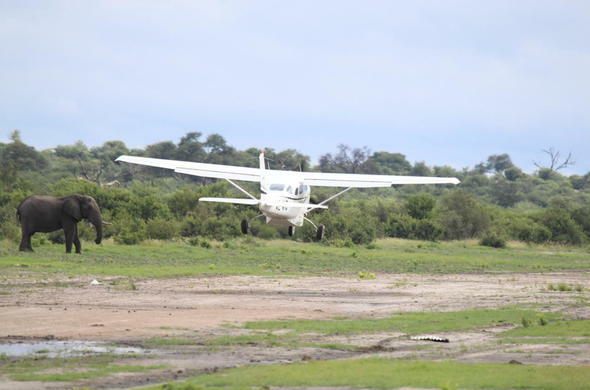 The landing strip at Savute Elephant Camp. Appropriate. Savute Game Reserve in Botswana is recognized as one of Africa's best game viewing. It lies south of the Linyanti in the Western Region of Chobe National Park in Botswana. Our Savute safari tours invite you to experience this dynamic wilderness area where you will stay in any of three beautiful lodges. From a classic safari to a family break or a romantic long week-end away, you're sure to find a Suvute safari tour to suit you. All safari game drives are led by experienced guides and rangers who know the area intimately. Savute's eco-system is unique - a mix of riverine woods, savanna and scrub-land. The region makes for a diverse wildlife experience - expect the unexpected, as animals from one type of habitat have to run the gauntlet across the unforgiving Savuti. The Savute has two dense animal populations - elephants (especially in the dryer winter months) and prides of lions. The zebra migration from northern Botswana into the Savute, starts in the rainy season. Enjoy a variety of activities on your Savute safari - the main highlights are bush walks accompanied by experienced and game trackers. On a night game drive you will encounter the many nocturnal animals such as Aardvark, Servals and Porcupines. All of our Savute Safari Tours include return flights from Johannesburg, except the self-drive safari options. If you are in search of adventure you can access Savute by road (with a 4 x 4 vehicle). The drive is arduous and slow going in some areas, but worth the effort. Savute is camping country with stunning scenery to compliment the excellent wildlife experience. Adventure travel at its best! The Savute has a group of distinctive hills which is one of the highlights of the Savute ccology. They are the site of many Bushman paintings, and are situated quite close to the ancient shoreline of a prehistoric lake which once existed in the region called the Magwikhwe Sand Ridge. Game viewing in the Savute Region is productive throughout the year. The best time to visit Savute is the winter season - from May to August. Traditionally referred to as the dry season - weather is temperate and mild during the day and bitterly cold at night. Game viewing is excellent due to the thinner vegetation in the winter months. Savute is at its hottest in September and October. The hot, arid landscape lends itself to incredible sightings as animals desperately struggle to survive. Winter - May to August: Dry. Mild in the day. Bitterly cold at night. Summer - September / October: Very dry. Very hot days. Warm nights. Excellent game sightings. Summer Rains - November to March: Game sightings are unpredictable but excellent. Migrant birds arrive. Mosquitoes arrive. Impala give birth. Zebras migrate through on their way to Chobe. Heavy Rains: January / February: Hot & humid. Thick vegetation hinders game sightings. Some roads are a mud-bath. Summer's End - April / May: Warm days. Cool nights. Sporadic showers. Wild-life starts heading to the more permanent water such as Chobe & Kwando Rivers, and the Okavango Delta. "Lying here under the clear Savuti night sky I wonder if there is such a place as Savuti in all of Africa. Here is a place that is haunted by its past and yet is legend in its present, a place where lions hunt elephants and herds concentrate during the wet season ..... the long drawn out whoop of a hyena caries across the magical Savuti night and then there is silence again".